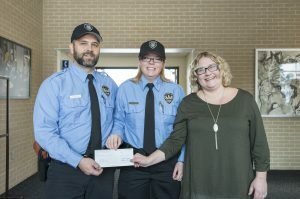 KCC Police Academy cadets, from left to right, Gabriel Weekly and Rachel Frommert, present Melissa Smith, shelter director and legal advocate at S.A.F.E. 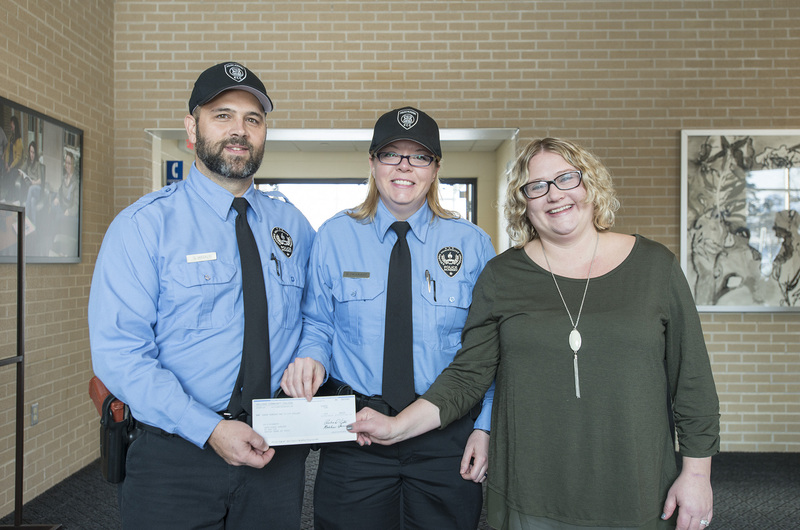 Place, with a donation of $300 from the College’s Public Safety Education Department. 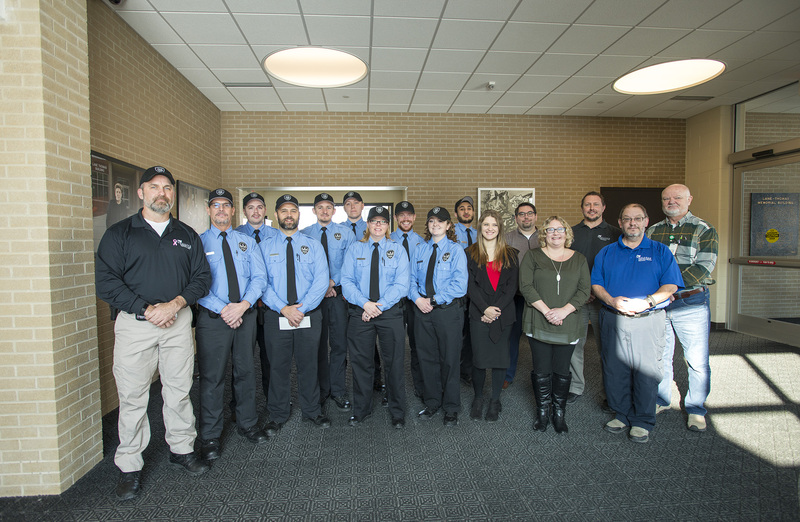 More than a dozen Kellogg Community College Public Safety Education students and employees together donated $300 to Battle Creek’s S.A.F.E. Place shelter last week as the culmination of a department-wide No-Shave November initiative. No-Shave November is an annual event in which participants raise awareness for a given cause by not shaving for the entire month. KCC Police Academy Manager Brett Weiss said his cadets voted S.A.F.E. Place as the recipient this year, which made sense as the initiative coincided with their unit on domestic violence. S.A.F.E. Place is a local nonprofit that offers free shelter and other services to victims of domestic violence. Weiss said Public Safety Education students and employees, including Police Academy cadets and members of the Emergency Medical Services Program, were given the option of paying $20 to either not shave (for the male students) or to keep their hair down (for the female students) during the month of November. Usually, cadets in KCC’s Police Academy must remain clean shaven, and those with long hair have to keep it secured in a ponytail. Melissa Smith, shelter director and legal advocate at S.A.F.E. Place, said the donation will likely go into the organization’s general fund, which helps support the facility’s immediate needs. KCC’s Public Safety Education Department, which houses the College’s Criminal Justice and EMS programming, participates in several community focused initiatives each year, including an annual community 5K each fall and an annual polar plunge event each winter to raise funds for Special Olympics Michigan. For more information about KCC’s Public Safety Education Department, visit www.kellogg.edu/public-safety-education.